A few years ago when I was extremely pregnant with my first son, my husband and I had reached the point of pregnancy referred to as ?nesting.? We were no exception to the nesting instinct and weeks before our son was born, we began preparing for our new lives the only way we knew how: We acquired a few tons of dirt, a mini-excavator, and went about the lofty process of replacing the useless grass in our backyard with a pump track. Some advised us that we?d be better off putting in a play structure while others warned that new parents would never find time for frivolities like riding bikes. But most folks looked on with curious bewilderment. ?So, you?re going to ride your bike around that thing?? ?And your kids will, too?? ?This I?ve got to see.? Fast forward a few years and two kids later, and the little pump track in my backyard has become so much more than I could have ever imagined. The neighborhood kids have transformed from wobbling toddlers to full-fledged bike riders on these mounds of dirt. Many weekends have been spent watching the collection of rollers and berms become a NASCAR racetrack filled with a dozen kids riding in circles until they’re dizzy. A few capes later, and the pump track instantly becomes a superhero training course and the Striders are now high-powered Batmobiles. I spent many evenings sitting back in awe of my husband who’s becomes ?the big green monster? as he chases our son around Planet Zorbal until they’re both winded from giggling so hard. After a break, it’s my son’s turn to be the monster as my husband shrieks and pedals away as fast as a father can (which is to say, just fast enough to always get caught.) When my youngest son tries to crawl over the berm and join his dad and big brother in the fun, the two-foot earthen mound becomes Mt. Kilimanjaro with a baby explorer attempting his first summit. 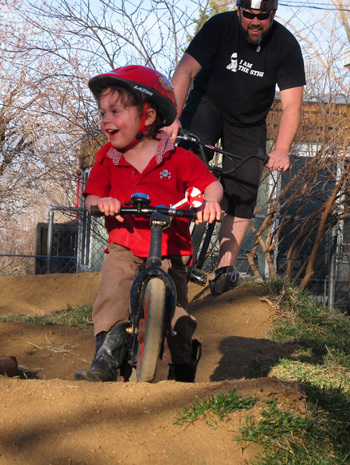 When we built the pump track, we had an inkling that it would become the best playground in the neighborhood. But it took the kids to show me that it was also the best superhero training course, mountainous landscape, and alien-inhabited planet in the neighborhood. What adventures are right in front of you? Grab a kid (preferably your own) and take a ride around your own area to watch uneven sidewalks become monstrous ramps worthy of Evel Knievel and a deserted side street transform into a time trial as 10-year-olds race their curfews. Or indulge your own inner-kid and turn the uneventful ride home into an epic battle of good (your sweet balancing skills) versus evil (the gravitational pull on that box of donuts you picked up on the way home). Adventure is all around us. Sometimes we just have to look a little closer to see it.